President Xi Jinping held a rare, high-profile symposium on Tuesday on building up philosophy and the social sciences, marking Beijing's latest effort to beef up its soft power and push for a larger say on the world stage. Addressing about 150 people, most of whom are leading figures in philosophy, history, Marxism and economics, Xi called for "more independent and innovative theories and ideas" that will take root from China's reality. It was the first time that China's top leader hosted such a seminar on philosophy and the social sciences. It was the third seminar held by Xi this year about the country's cultural sector. 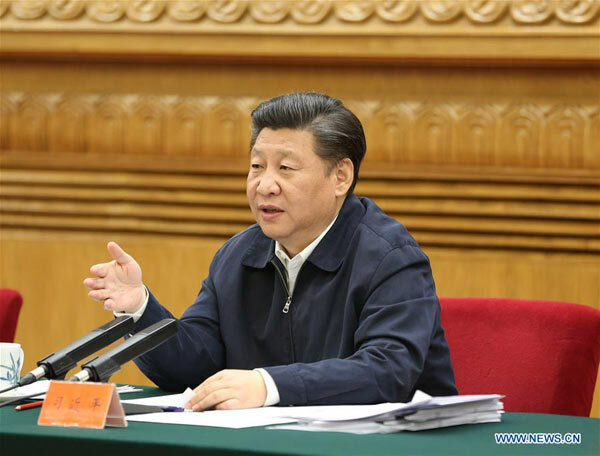 The first was Xi's February speech about the role of China's media, and the second was his seminar in April on the nation's internet industry. "While China undergoes the most extensive and sophisticated social reform in its history, this is an era that needs theory and gives rise to theory, this is an era that needs thought and gives rise to thoughts," Xi said in a 100-minute speech. The president said a country without advanced development of the natural sciences cannot be a leading nation, and neither can a country without booming achievements in philosophy and the social sciences. He urged the academicians to follow the guidance of Marxism, to base their work on national conditions, and to draw on achievements from foreign countries and history. Observers said that Xi, concerned with the weakness of the country's soft sciences, aims to enhance China's cultural confidence, sweep away confusion among its people brought on by the country's rapid social and economic transition, and make China better heard on the world stage. Hu Angang, an economist at Tsinghua University, said at the meeting that the event reflected the importance the central leadership attaches to the field, since it is a matter of achieving cultural prowess after becoming an economic giant. "Against the background of China becoming a rising power, we need to lay a solid foundation in the theoretical and cultural fields," Hu said. Justin Yifu Lin, an economist at Peking University and a former World Bank vice-president, said some Chinese lack confidence in China's development path and institutional systems amid rapid social change. A major reason for this is that the country's philosophy and social sciences lack adequate theories that can explain China's economic and social scenario, Lin added.